Attention, yodelers. Here is something The Frau had lost hope for…and yet, guess what? 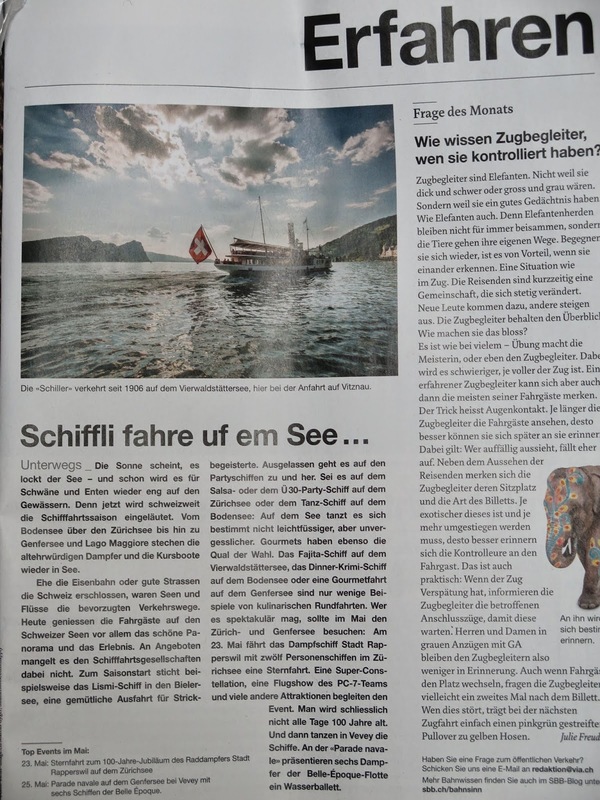 The Frau is reading...and getting the double meaning...of...wait...you guessed it...a Swiss German magazine headline! Not bad, since Swiss German isn’t even supposed to be a written language. A South African colleague at her office in Zurich once reassured The Frau that she would start understanding Swiss German once she had kids. He was right. Because here, yodelers, in the Via Magazine (freebie magazine available on Swiss trains), is a headline, “Schiffli fahre uf em See.” The Frau recognized it immediately—not only could she understand its meaning, but she also knew it was the title of a very popular Swiss children’s nursery song about a boat (all Swiss kids seem to sing it–even non-Swiss kids like Toddler M). Needless to say, The Frau was very proud of her comprehension. In fact, she was so proud that she must have looked ridiculous, grinning and gloating over such a simple headline. It was definitely an Erfahren. Appropriate, since that was the title of the magazine section. Achtung. Shameless self-promotion part. Did you enjoy reading about Swiss life? Then you might enjoy The Frau’s new book, Swiss Life: 30 Things I Wish I’d Known. It even has a section on language. Available at fine online retailers and on Zurich’s most famous shopping street too (Bahnhofstrasse 70). Just found your blog...it's super fun and funny too. I was raised by german speaking Swissies here in Vancouver Canada (from SG and TG, respectively). When I was a teen I read Eugene Epstein's series on the theme you write on: an American's experience with the Swiss. If you haven't already read them, the story about how he once set up to get his bike stolen (he eventually had it swiped, only to discover that a concerned citizen had brought it to the local polizei station. The police warned Epstein to keep his belongings indoors and safe. HA!) is super hysterical! And never ending Swiss conversations too...reminded me of my childhood for sure! Ignore the troll. I get a kick out of your blog and enjoyed your book, too.Once upon a time I was a young mom in Switzerland,so I can really relate. Yes, Melissa, I have read Epstein, and the bike story was one of my favorites. Glad you like the blog. Hattie, thanks, glad you liked the blog and the book! Cheers.